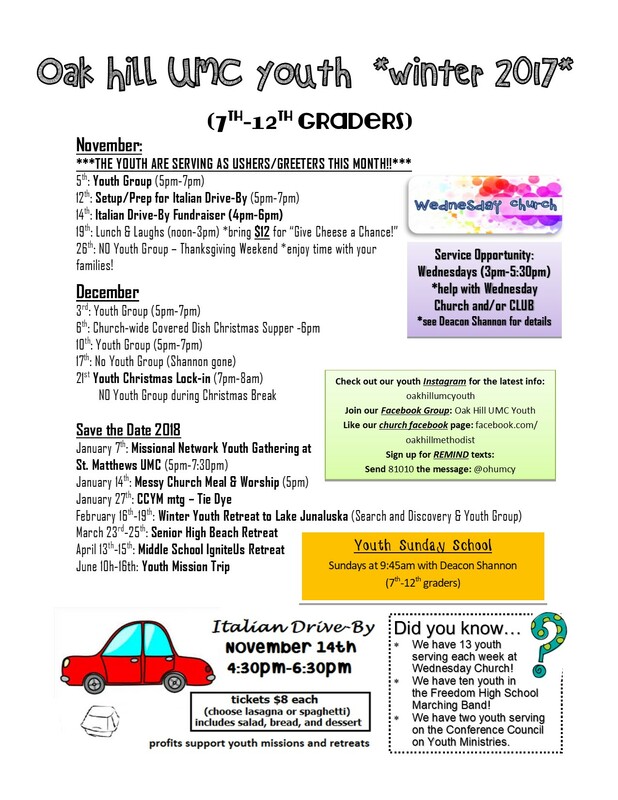 Oak Hill Youth Ministry is for 7th-12th grade youth. We meet on (most) Sunday evenings for Youth Group from 5pm-7pm, where we have dinner together, enjoy fun and games and explore what it means to follow Jesus. Youth Group is an awesome place to have fun and grow in your faith, all while developing meaningful, lasting relationships with peers and adult leaders. We split up into small groups as needed for discussion and activities. Beyond Sunday evenings, we go on retreats, do service throughout the community, go on mission trips over the summer, and put our faith into action in various ways. We also have an engaging Sunday school class that meets in the Youth Room at 9:45am. Our goal is simple: Love God and Love our neighbor.